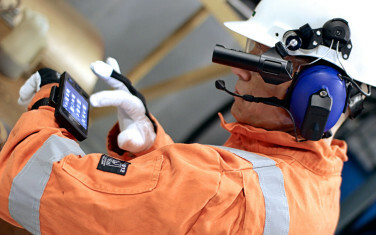 Impact X is the world’s first smartphone for hazardous areas, combined with the Orbit X HD helmet camera the smart devices allow users to work safer, smarter and more effective. It’s fast become an international sensation and is Norway’s first foray into the smartphone business. EGGS has been involved in the whole design process, from concept development to finished industrialised product. For years, employees within the oil and gas industry were lugging around vastly outdated, bulky equipment in backpacks, and had no real-time connection with either their fellow workers or families and loved ones’ back home. Any type of conventional phone or electrical device is strictly prohibited, as even the smallest spark can cause a major explosion. The need for a new type of EX certified product, approved for use in areas where gas leaks and explosions can happen, such as oil platforms, rigs, refineries or mines, was essentially overdue. Pixavi originated as a small entrepreneurial business based in the oil city of Stavanger and was acquired by Bartec in 2013. In 2005 they signed an open partnership with Shell, who were looking to find a future solution for the safety and well-being of all their mobile workers. EGGS came on board soon after, helping to forge a winning combination of “nerds with passion” who then started brain storming ideas and solutions round the clock. We worked tirelessly at fusing state of the art technology creating a solution that is rugged and trustworthy yet familiar as a smartphone. The biggest challenge overall was that the product had to be developed under ever changing circumstances. The technology available was constantly evolving and therefore we had to develop many prototype models, involving a lot of trial and error along the way. With the user always at the forefront of our minds, the end result is a brilliant example of how a small, close-knit and highly motivated team can achieve world class innovation, whilst moving mountains. The Impact X is a remarkable and highly durable niche device that has been developed to thrive in extreme working conditions. The user has access to all the latest, familiar apps available for an Android based smartphone and allows them to call who they want when they want. Mobile telepresence, video conferencing, office mobility apps, inspection and maintenance apps, and communication tools all help make the users everyday lives much safer and more efficient. The phone is both waterproof and glove friendly, leaving the user protected at all times. The Orbit X camera incorporates superb HD quality optics producing eight megapixel still images, and has a powerful built in flash for low light conditions. 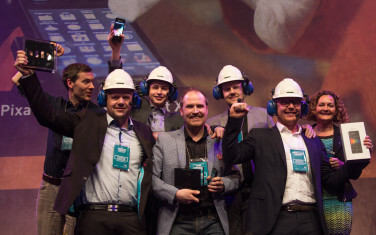 In April 2014, Impact X and Orbit X won the Norwegian Design Council’s Award for Design Excellence. In addition, BARTEC PIXAVI was nominated for the ONS2014 Innovation Award, and has also gained much local and international media attention. Incorporating dynamic design thinking and described as the world’s most rugged phone on steroids, this unique product is nothing short of a revolution within EX certified products.